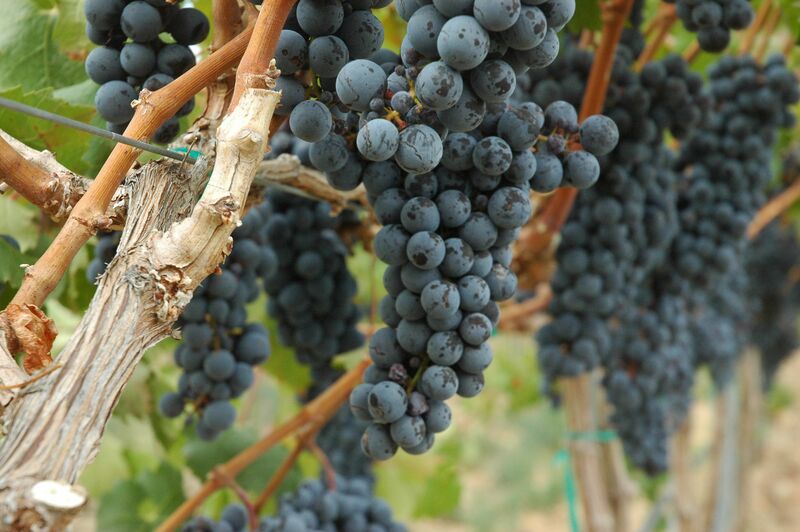 When the U.S. Department of Agriculture released its annual snapshot of the Washington wine grape harvest Friday, a few interesting statistics stood out. Most prominent was how the top four grapes in the state stand apart from all the rest and now are nearly even in production. Nothing else is close to these four, and combined they made up 144,100 tons of grapes in 2012 (that’s more than the state’s entire total in 2011, when a freeze dramatically cut down the wine grape crop). And combined, these four make up nearly 77 percent of the state’s total. In fact, Riesling was, by far, the state’s biggest grape in 1985. Let’s take a closer look at each of the big four. As we can see in this year-by-year production chart, Riesling production was stagnant until 2002. This was two years after Chateau Ste. Michelle and Ernst Loosen released their first Riesling under the Eroica project. It was the year before Bob Bertheau arrived as Chateau Ste. Michelle’s head winemaker (he had no experience making Riesling when he arrived from California). 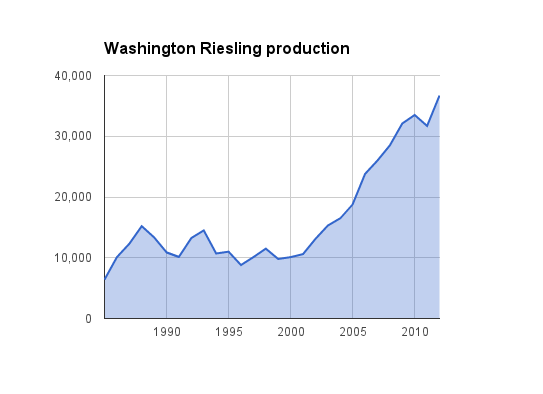 It didn’t take long after that for Washington’s Riesling production to triple in tonnage, fueled primarily by Chateau Ste. Michelle, which now makes more Riesling than any other winery on the planet. In fact, that beginning in the rise of production has fueled a Riesling revolution in America that has been fueled by Ste. Michelle. And it wasn’t exactly planned. “In retrospect, it really looks brilliant,” Ste. 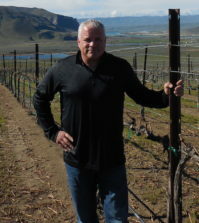 Michelle CEO Ted Baseler told Great Northwest Wine with a laugh. He said it all started with Bob Betz, M.W., then an executive with Ste. Michelle, having lunch with Loosen, one of Germany’s most famous Riesling producers. Ste. Michelle got even more serious in 2007, when it brought on Wendy Stuckey to head its white wine production. She was renowned as one of the top Riesling makers in her native Australia. While Ste. 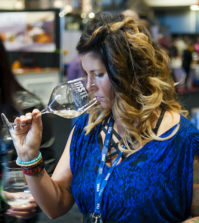 Michelle is – by far – Washington’s Riesling leader, other wineries also are fueling the white wine’s growth, including Hogue Cellars, Pacific Rim Winemakers, Covey Run and Columbia. Each produces more than 100,000 cases of Riesling per year. With the development of AVAs such as Lake Chelan and Ancient Lakes of Columbia Valley, Riesling production is likely to continue its impressive growth for several more years. High-quality Rieslings from other regions of the United States, particularly New York’s Finger Lakes region, Michigan, Idaho and Oregon, also helps grow the category. 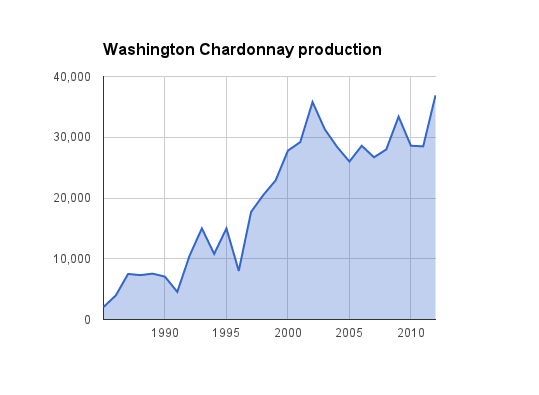 Chardonnay growth in Washington wine country basically follows the grape’s fortunes in California. When the white grape of Burgundy became America’s favorite wine (as it remains today), Washington growers and wineries got on the bandwagon. The grape hit 10,500 tons in 1992 and, except for a blip in 1996 from a deep winter freeze, it was on a meteoric rise from 1992 to 2002. The same year Riesling took off in Washington, Chardonnay suddenly leveled off. It didn’t reach more than 30,000 tons again until 2009 (33,400) and again last year, when it hit a record high of 36,900. This makes Chardonnay the state’s No. 1 grape again – just barely. Once again, Ste. Michelle Wine Estates is the state’s biggest Chardonnay producer. In fact, when Bertheau arrived in Washington, one of his areas of expertise was Chardonnay, thanks to his work in such California wineries as Gallo of Sonoma. “When we got ahold of Bob, we knew he was one of the top Chardonnay winemakers in the country,” said Doug Gore, who is Bertheau’s boss at Ste. Michelle. “Chateau Ste. Michelle is not just a Riesling winery,” he told Great Northwest Wine. 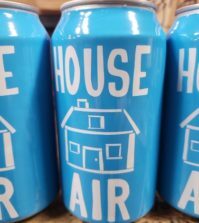 At Hogue Cellars, Riesling rules in whites, but Chardonnay is becoming more important, says Co Dinn, director of winemaking at the Prosser winery. “Our focus is still heavier on Riesling than Chardonnay,” he said. But Hogue has launched a label called Thorny Rose, which makes five wines, one of which is Chardonnay. “Thorny Rose Chardonnay has bumped up our Chardonnay demand,” he said. While such varieties as Syrah (11,800 tons), Cabernet Franc (3,400 tons) and Malbec (1,800 tons) helped, Cabernet Sauvignon and Merlot are the big guns. Let’s take a look at each of these. 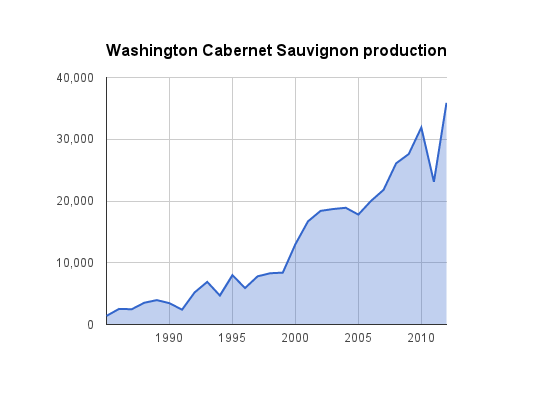 As we can see in this chart, Cabernet Sauvignon was a small-production Washington wine grape back in 1985 – when many still believed Washington was too cold to grow world-class red wines (even though the Columbia Valley typically matches or exceeds Napa Valley in heat units in any given year). The growth in Cab has been steady since then, with big spikes coming in 2000, 2008 and 2012. The big dip in 2011 was a result of a historic freeze that hit the Horse Heaven Hills particularly hard. The region south of the Yakima Valley has proven to be a sweet spot for Cabernet Sauvignon, and that’s where major plantings have occurred in the past dozen years. Mike Andrews, owner of Coyote Canyon Vineyards in the Horse Heaven Hills, grows 1,123 acres that includes 26 varieties. Of that, more than 520 acres are Cabernet Sauvignon, mostly grown for Columbia Crest, as well as Northstar, Col Solare, Chateau Ste. Michelle and more than a dozen other wineries. 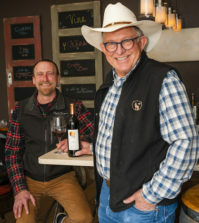 Andrews began planting wine grapes in 1994, and his brother and father started in 1980, making them among the first in the Horse Heaven Hills. The whole Andrews family got hit hard in 2011, when a freeze in November 2010 knocked down a big chunk of their vineyards. “We cut 650 acres to the ground and retrained it,” he said. It was the worst freeze in the Horse Heaven Hills in more than 30 years, and growers hope it’s at least that long before it occurs again. 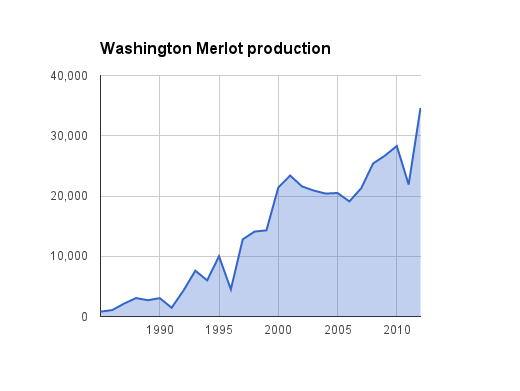 Back in 1985, Merlot was the lowest of Washington wine’s big four. In fact, it was behind Chenin Blanc, Sauvignon Blanc, Semillon and Gewürztraminer – a time when white wines ruled in Washington wine country. That year, Washington crushed 13,710 tons of white wine grapes – and just 3,390 tons of reds. But all that changed in the mid-1990s, when Merlot production not only caught up with Cab, but also surpassed it. In fact, Cab didn’t move ahead of Merlot production until 2006 (with the exception of 1996, when a deep winter freeze hurt Merlot as much as any grape variety). One might note that Merlot production in Washington dropped below 20,000 tons in 2006, just two years after the movie Sideways came out – with its famously disparaging remark about the grape made famous in the Bordeaux appellation of Pomerol. However, Merlot tonnage began dropping in 2002 – two years before Sideways was nominated for an Academy Award. In fact, that coincided with the increased production of Cabernet Sauvignon and Syrah. Merlot’s slump ended in 2006 and has dramatically increased since then, topping 30,000 tons last year for the first time in the state’s history. The big dip in 2011 also can be attributed to the November 2010 freeze. Columbia Crest, where Gore was head winemaker for more than two decades, makes more Merlot than any in Washington. Production from the 2009 vintage of its H3 Merlot (using all Horse Heaven Hills fruit) was 58,000 cases, Grand Estates Merlot was 69,000 cases, and Two Vines Merlot was 118,000 cases. Sister winery Chateau Ste. Michelle, best known for Riesling, also makes a fair bit of Merlot, producing 104,000 cases of its Columbia Valley tier and 65,000 cases of its Indian Wells tier in 2009. 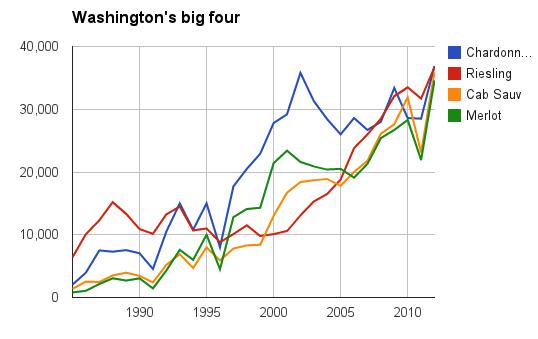 Though this chart is a little hard to look at because of the intersecting lines, it does show the growth of all four of Washington’s big four varieties. Three of the four started almost identically in 1985, and now all four have intersected again in 2012. Extremely well done article! Thanks for the great information. May I have permission to use this on my blog? Feel free. We always appreciate a link back, of course.